Today I have the final post about making my orange 1840’s dress to share! I planned on this going up sooner…but we all know how my blog plans go (the don’t). However I can promise that this post will be followed by one with photos of the finished garment when worn! The last post ended with a finished bodice – (if you missed that post, it can be read here) but there was more work to be done! Like making the skirt, and a matching headpiece. Because you need a matching headpiece. The skirt was really easy – it’s just three 42″ wide panels seamed together, hemmed, and gathered down to match the waist measurement of the bodice. After stitching the pieces together I folded the bottom edge inward by a half inch. Then I folded the bottom edge inward by three inches, and stitched it down by hand to avoid visible topstitching. Since the skirt was three panels, and evenly gathered, a seam didn’t fall at the center back. So I had to slash one of the panels and finish the opening with bias binding. This will line up with the back opening of the bodice and allow me to easily get the dress on and off. The top edge was gathered down. I turned the bottom edge of the bodice inward by a half inch. Then topstitched the skirt to the right side of the bodice. The raw edges were all hidden by a band stitched to the outside of the bodice. This was visible on the extant garment I referenced, which is why I chose to do it this way. I ended up sewing the skirt on kind of unevenly – but it was intentional! this way it rests a little higher at the front. That finished off the dress! Overall, I’m happy with this. However the fit could use some work (I would say it is a full inch too big) and it really needs a modesty panel. Since I used hooks and loops, my foundations were slightly visible at the back. But as I said in my last post, I’m going to resolve that by swapping the loops out with bars, and having the back edge overlap by an inch (this will fix the fit, too!). I think my favorite part of this dress are the gathers – I love the effect of hand stitched, dense gathers, and they are plentiful on this dress! I’m also happy that I’ve finally (somewhat) successfully executed the tiny piping which was so popular during this period. It makes me feel more confident about some 1810-1820s pieces I’ve wanted to make for a while! And here is the hem after being ironed! As far as headwear, I decided this dress needed a bonnet. I based mine on a few references…but I won’t share them, because it looks nothing like them! I decided to use a cheap straw hat as a base (this one, to be exact), which meant the design had to conform to the existing shapes of the hat. I used the cap for the back of the bonnet. And cut down the brim to form the front. I stitched wire into the edges of the pieces to make them posable. This was a nightmare, the straw kept cracking and it killed my fingers. I don’t think I will ever attempt hand sewing with this straw ever again. I lined it with a peachy colored silk dupioni. This wasn’t fun either, but there was less tension pulling on the silk so it was slightly more forgiving on my fingers. I used a rectangle of silk to make lining for the cap, too. Here the cap is attached to the brim – I mostly used glue for this, since my hand stitching kept tearing out. I added ties and flowers, and the bonnet was done! Visually this is fine, and it suits the costume well. But I despised making this. It sucked having to alter my vision to the shape of the straw, and the straw was so difficult to work with. I had to glue a lot of elements and the end result is less durable than I would have liked. But it is cute. So there is that! Here is everything worn together! And as I said, a full post of photos will be up soon. This post will cover making the accessories to go with the redingote featured in this post! 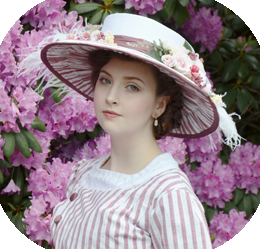 I’ll be talking about a ridiculous hat, a fichu, and a petticoat/skirt. I’m also including a review for the shoes I purchased to match, which are the Fraser style by American Duchess. I’m going to start with the skirt, since it’s probably the “biggest” part of the costume, after the redingote. My original plan for this was two rectangles, one for the body of the skirt, and one for a ruffle around the hem. But I just finished making a skirt like that out of a different fabric. And I made two others the year before. And another the year before that. They are easy to do, but kind of boring. I knew I wanted to put a twist on this, and eventually decided on making the ruffle with a zig-zag hem. I thought this was appropriate – it kind of reminds me of the texture of leaves, or if we are really stretching to meet the Halloween theme, the teeth of a carved pumpkin. I’m glad that I did this since it’s way more interesting than my other skirts…but it was alway way more labor intensive. I decided to back the main suiting with a thicker one. This will give it more structure and help the points hold their shape. I probably would have used taffeta, or a lighter material if I had one around, but this worked in a pinch. I traced all the points onto the lining – this along took an hour. This was an eight yard strip of material. Sewing them took another hour. Then I trimmed around each edge, and clipped the points and corners. I also used a seam ripper to remove the stitch at the very top of each concave point. This makes it turn out smoothly, but does reduce long term durability. And it was gathered down to be four yards long, the same width as the top portion of the skirt. Here you can see the drawer unit I kept rolling around to support the fabric as I sewed – this was super heavy! I sewed it to the top portion of the skirt with a three quarter inch seam allowance. It still looked a little drab, so I decided to make a ruffle out of leftover brown taffeta. This helped tie the garments together, and added more interest since it’s a different texture. I cut strips out of the fabric on its bias with pinking sheers. Then I sewed the strips together, and gathered them down the middle. I sewed it onto the skirt in large scallops. I did all of this by machine since I was rushing. If I wear this again I want to cover the stitching with trim or beads. It doesn’t look great and isn’t super even since the skirt was so hard to get through my machine. But from a distance I really like it! Then I lifted the waistline of the skirt until it sat at the length I liked. I trimmed the excess, and gathered the top edge. I made the waistband out of matching fabric, sewed in a hook, and sewed up the side seam. I really like how this turned out, but the waistline is a little large – it kept slipping down and is visible in some of the pictures. So the hook has to move before re-wearing. Next up: The fichu. This is basically a shawl that could be worn under dresses as an alternative to an undershirt. 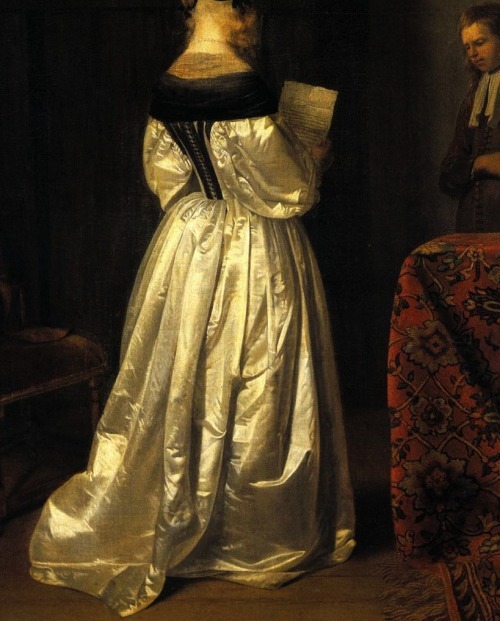 They would fill out the neckline, make dresses more modest, and serve as a stylistic choice. I made mine in an hour or two, out of a scrap of thin cotton and two four yard lengths of mesh lace. I started by cutting out a triangle – as large as I could from the material I was working with. Then I turned the edges inward by a quarter inch, twice in order to finish them. I did this by hand, but machine sewed everything else, which was sort of silly! I used two four yard lengths of lace from etsy. One has little bows on it, the other is a leafy design. I liked the leafy one more, so I put it closer to the top. Then I covered the gathered edge with a narrow mesh lace. I like how this looks, but I wish the lace was more dense. I may add onto it before reusing it. 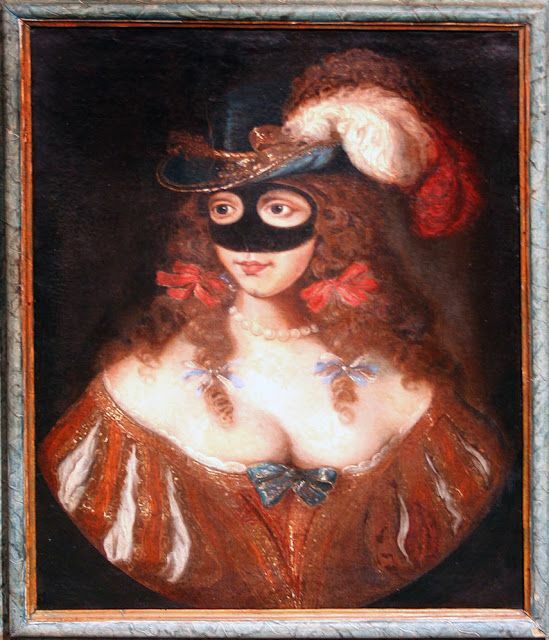 I see myself getting quite a bit of use out of it with other costumes, since this was a staple in most 18th century ladies wardrobes! Now for the hat! I might be biased, but I think this is the best part of the costume. Looking at it makes me smile. Wearing it makes me smile. It’s great. I made this based on images in Women’s Hats, Headdresses and Hairstyles*, along with references from various paintings. I constructed it from a self drafted pattern, out of felt weight interfacing with wire sewn into the edges. Then I covered the pieces with interfacing, lined them with scraps, and stitched them together with upholstery thread. It took me two evenings to finish. The brim is lined with orange silk (leftover from the pumpkin dress!) and more brown taffeta ruffles. I trimmed the exterior with a strip of the striped silk (I cut the edges with pinking sheers), and a band of the orange silk. These were loosely sewn in place since the top of the hat narrows and they kept trying to slip upward. For decorations I made a rosette from more strips of silk. These were gathered down as tightly as I could, then I sewed up the side seam. I was going to add a smaller ruffle to the center, but I decided beading it would be more fun. So I stitched a base of suiting material onto the back to support the embellishments. The embellishments consisted of a bunch of faux pearls, and a spider brooch. The back of this had bent and was really thick, which made it difficult to wear. So it got a new home here! I think it looks quite comfortable. In my mind this added to the totally not obvious witch element. I also liked how the orange stones would catch the light. That was glued on, along with a white feather and two pieces of fake fern. I was originally going to use orange feathers, but I like how the white one ties in with the pearls and lace on the dress. The ferns – though completely inaccurate, tie the colors together really well. They fade from a deeper orange (like the striped silk) to a lighter orange, like the shantung scraps. It’s one of my favorite hats i’ve ever made – I think the contrast and trims are perfect! And that is it for the pieces I made! So if you want you can stop there. But I did want to mention, and give a little review of the shoes I bought to go with this. These were my main purchase last month. The price hurt a bit, but I’ve enjoyed my other historical themed footwear so much that I wanted something similar for 18th century projects. I invest so much time into pieces that accurately(ish) represent the period from the hem upward, it seems like a shame to skimp out on the shoes! Plus they will go with a lot of future projects too, not just this one. They are the “Fraser” 18th Century Leather Shoes (Black)(1700-1760)* by American Duchess, listed here*. I purchased them in a size 10, along with the cavendish gold buckles. Overall, I like these. The shape is lovely, and surprisingly flattering to the foot. I adore the side profile – the heel is so cute! And the shell of the shoe is very soft and flexible, which makes them more comfortable than the vast majority of my shoes. I also like the sheen of the leather used, and that natural materials were used for the lining, too. The construction of them seems nice, and they were symmetrical and free of flaws. They also came with replacement heel caps. I compared them to other shoes I own that are a similar heel height, and they were the same length if not a little longer. I’m a solid size 10, and these fit me well lengthwise. On the downside, the fit is hard to determine until after the buckles are installed, and they obviously aren’t returnable after the buckles are in. I found the shoes a little big width wise and assumed the buckles would tighten them. I placed the buckles as far back on the latchet as I could (up until it tapered to a point where it would not fit through the buckle smoothly) and they are still a little large on me. I probably would have returned them for a 9.5 if I had known. The buckles are also way harder to install than I thought. There is a diagram on the website, but I feel like a video or picture tutorial would have been more helpful. I ended up using photos of the shoes with the buckles installed as more of a guide than the actual tutorial. Neither of those are really flaws of the shoes, just things I noticed. My only real disappointment is how much the lining frays. The edges are topstitched to the interior of the leather, not folded inward. So there isn’t anything preventing it from fraying. And since the shoes are black the raw edges of ivory lining are quite obvious. I’m going to trim the frayed edges and finish them with glue, which isn’t a hard thing to do at all, but it would be nice if it wasn’t an issue. Now for the wear test! I wore these for around 2 hours during the photo taking process. They really are one of the most comfortable pairs of shoes I’ve ever worn, and the leather didn’t mark at all – even when walking through some rough terrain. The soles got super dinged up, especially around the edges, but I was expecting that. I was walking through gravel, and on unpaved paths, so it’s understandable. But it was a very very short walk. I’m not sure how these would fair at reenactment events where you are more active on similar terrain, or even on a daily basis with textured asphalt. I did notice that one shoe creased quite a lot at the toe. I’m not bothered by this, but it’s kind of odd that it only happened to one of the shoes. It looks like I buckled this one a little tighter (though I could still get it on and off without unbuckling it…so I don’t think it was *too* tight) which might have been the cause. Those are my thoughts! Visually I love them, and I’m very glad to have them. I don’t think they would be the best shoes for everyday use (I wasn’t expecting them to be), but I will really enjoy wearing them with other 18th century pieces. I think they are a nice finishing touch to the costume! Most of the negative things I mentioned aren’t even negatives. They are things that happen when you wear shoes. They go on the ground. They wrinkle. I made peace with it before buying them. But I was curious how the more authentic materials would wear compared to plastic and rubber, which is why I mentioned it. Now I’m eyeing up the red kensington and edwardian pumps…but those are a few paychecks away, at the very least! That is it for this one! I should be back with more photos tomorrow, and maybe a video if I can get it done in time. Todays post is about a real doozy of a dress that I made over the last two weeks. It consists of a redingote, petticoat, hat, and fichu. I even bought some fancy period appropriate shoes to go with it! I’m going to split this into two blog posts – one about the redingote, and another about the accessories. Both posts should be published back to back, with photos of this ensemble following on Monday. This project was driven by the idea of making an 18th century witch costume. This has been in my head ever since discovering this magazine page, which is the 1890s take on a 1700s inspired witch fancy dress costume. I felt very strongly throughout making this that is was a witch costume. I think the hat made me think of pilgrims, which reminds me of the salem witch trials. The timeline for those things doesn’t even line up, but it was so clear in my head while constructing it. However looking at it now, this costume doesn’t actually have anything that makes it “witchy”. So i’m not sure why I felt that way about it. But that was definitely in my mind while working on it (especially the hat)! And this motivated some of the choices later on so I thought it was worth mentioning. As far as design, I’ve always wanted to make a tall 18th century hat, and been interested in redingotes since discovering them during my riding habit research a couple years back. Then during a visit to Fabric Mart in PA I discovered an orange/brown striped silk taffeta which seemed perfect for an autumn themed 18th century ensemble. I combined that with a suiting fabric I had around, and some other scraps, and this piece was born! My inspiration was originally this piece, but that was more of an inspiration to make a redingote, not something that shaped the design. For the collar and cuff details I used this as a major reference. And I used more elaborate examples, like this, to justify the long impractical train. To be honest, I didn’t do a lot of research on redingotes prior to making this. I was too impatient to delve deeply into it before getting started! From my understanding, “Redingote” was a term used to describe riding and hunting costumes for both men and woman (interchangeable with the riding habit). But *most* plates and pieces described as redingotes have a skirt extending from the waist to the ground, and are ofter paired with contrasting petticoats. Women’s riding habits were usually two matching garments, with a shorter flared jacket and skirt with side closures. It also seems that the term redingote was later used to describe open front day dresses that lacked the practicality that most riding habits have, but still have some of the military style detailing. Mine definitely falls into the latter, impractical category. This project began with a bodice mockup. It’s three pieces, with the collar incorporated in each piece (as opposed to being sewn on later). I also used very appropriately themed mock up materials! The mock up fit pretty well, I was thrilled with how the collar looked. There were only minor alterations to be made at the centerfront and straps. For the first time in a long while, I made this bodice without a heavy duty base layer. I was worried the seams would get too thick if I did, and lighter dresses are always more comfortable to wear. So I cut the “base” from quilting cotton. The lining is a suiting fabric I bought online for $3 a yard. It’s a low quality suiting, but I like the texture it has. And it’s a weird greyish light brown that matches the brown stripes in the taffeta really well. And the exterior is the striped taffeta! Carefully cut out so the back seam would line up. The cotton and suiting were layered, then assembled together. The cotton adds a bit of stiffness to the flimsy suiting. The seam allowances were turned inward and stitched down to create boning channels. The bones are all plastic, purchased from onlinefabricstore.net. The construction process was repeated with the silk taffeta. This material was on clearance for $8/yard, which is hard to beat for silk! Five yards of it went into this dress. I managed to get the back seam matched up without basting – I was very pleased! I sewed the lining to the silk with the right sides facing each other – I stitched around the collar and waistline, only leaving the arm holes and front edges open. Then I turned it the right way out and used embroidery floss to stitch around the edges. This added a bit of texture, which I liked. Unfortunately as a whole, I didn’t like it. It looked dull. The suiting didn’t have enough contrast with the silk, and the collar didn’t look as big and dramatic as I wanted. I didn’t have enough material to recut things, so I decided to sew piping around the collar. This made it appear slightly larger, and more interesting with the addition of a new fabric. This piping is made from brown poly taffeta over cotton cord. I had the taffeta leftover from the brown doublet I made several years ago. The piping was made by machine, but sewn on by hand. All the raw edges were turned inward and tacked down with whip stitches. Unfortunately these are on the outside of the bodice, which I don’t like, but they are hidden by the collar. The sleeves were a lot of trial and error. I based them on a Norah Waugh pattern, but they ended up totally different. I cut the sleeve cap way down and played around with the width. I wanted them to be tight, but allow more mobility than the original pattern did. I also wanted to get them on and off without having to add closures at the wrist. Boy were these a terror. The mock up looked good, but the finished sleeves were an inch too big! I took them in three times before the looked okay. Then I made the cuff, and sewing those on made the sleeve too tight. So I had to remove the cuff, remove the lining of the sleeve, let the sleeve out, then resew on the cuffs. They still aren’t perfect – they are a little wrinkly and baggy around the upper arm. Maybe i’ll redo them someday. The cuffs were made from the same suiting, but I backed them with interfacing. The edges were turned inward by hand, then piping was sewn on. The piping for these was made very carefully, there are gaps without cord so the pieces can overlap without additional bulk. And the cord ends before the seam allowance starts, so there isn’t bulk there either. The sleeves were finished with a lace ruffle. I used a lace with a feathered trim, which adds a really nice texture. The lace was gathered by machine, then whip stitched into the cuffs by hand. Here it is on the dress form. At this point the only thing left were closures, and the skirt. The closures consist of 6 hooks and bars that secure the bodice one inch to the left of the center front. The buttons were placed on either side of the closures, spaced evenly from the center front. I planned on looping lacing made from taffeta around these, to create an effect similar to the one seen in my main reference. But the lacing wouldn’t stay on, the shank of the buttons wasn’t long enough. I don’t mind it without the lacing, but I still want to add it at some point since it was part of my original plan. I don’t have many pictures of the skirt, because it was made in three hours the day before photographing this costume. It’s two 63″ x 58″ rectangles sewn together, with the bottom edges rounded out. I turned the edges inward by a half inch twice, then whip stitched them down by hand. 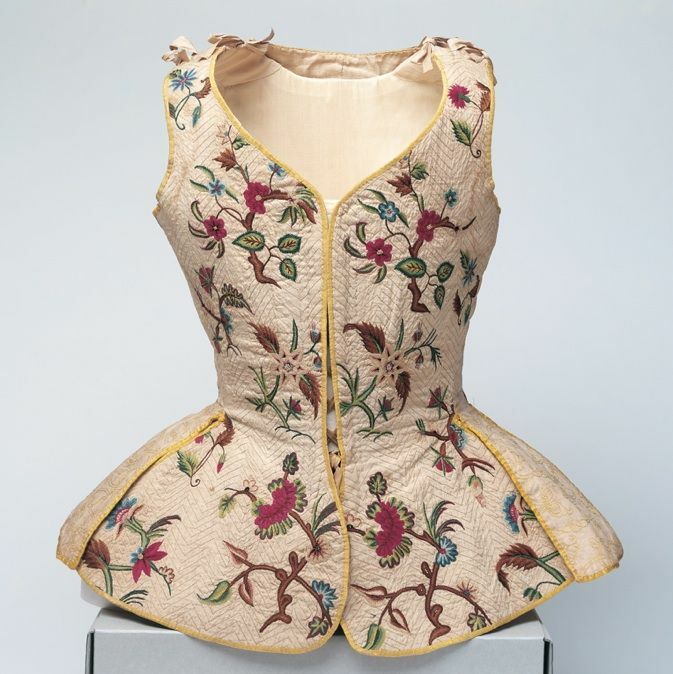 The top edge was pleated with 1/4″ pleats, then sewn to the bodice. I left the top edge of this raw, and didn’t whip stitch the seam allowance down since i’m not completely sure if I like the skirt positioning. I think it sits too far back at the bodice, so I might redo the pleats before finishing it properly. And that is it! Overall I like this garment. My only complaint is that it’s a little big. My seam allowances must have gotten screwed up somewhere, the silk is almost baggy on top of the lining (though this could also be related to the lack of a thick base layer). The sleeves are still a bit big too. But it was really comfy! And I think the fabrics and proportions work really nicely in the finished piece. Thanks for reading – keep an eye out for the following posts! It’s taken me longer than I had hoped, but I’m finally back with a “Making of” post! 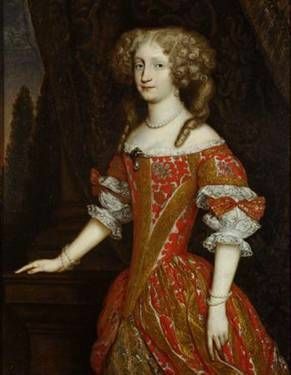 And it focuses on a project I’m really excited about: a seventeenth century ensemble. I’ve wanted to make something from this period for a long time. It’s not a popular period for historical re-creation, but I’ve been attracted to it since I first started researching historical fashion. The high waists, bright silks, full sleeves, and jeweled decorations really appealed to me. 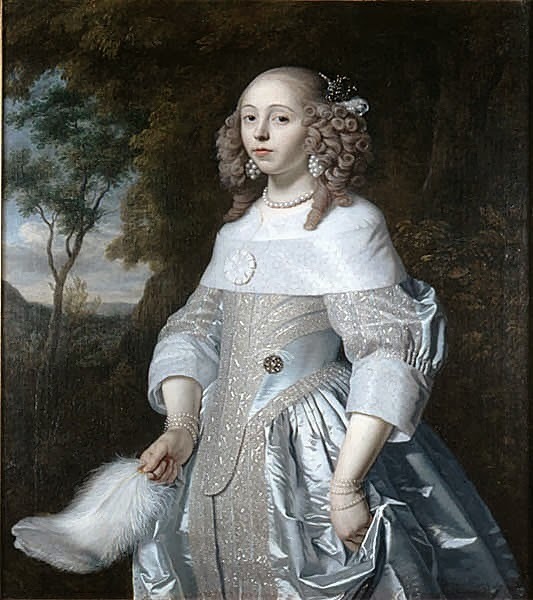 And now that I know more about fashion from the 1500s and 1700s, I find the mid 1600s even more interesting since they are so drastically different than what came before them. It’s also the period depicted in most of of Rembrandt and Peter Paul Rubens work, who are some of my favorite artists. 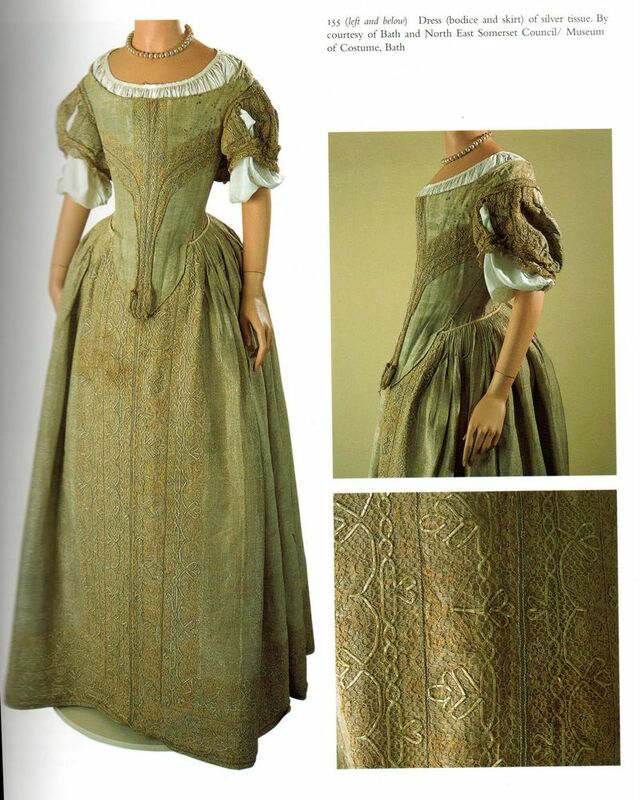 Despite my interest in the era, I haven’t completed a costume from the mid 1600’s. I’ve made some attempts, and even gotten pretty far! But bad fabric choices, fit issues, and poorly thought out designs have led to failure every time. But this time I was determined. And luckily things went a lot better. My previous attempts were based on simpler dresses that were free of decoration. I’d still like to complete a dress of that style some day, but I thought success would be more likely if I went in a different direction. Then I came across this painting and fell in love. I don’t like the mask, but textures, print, colors, and details really drew me in. I love the sheen on the dress, and how much depth it has. The amount of trim on it, and the paned sleeves looked like they would be a lot of fun to recreate. And I adore the hat, it helps balance out the proportions of the sleeves and skirt. I couldn’t find a fabric deep enough in tone to match the painting, but I did find a lovely peach/orange/gold brocade in my price range. It’s from Fabric Express in NYC and cost $6/yd. I purchased eight yards but barely had enough material left to cut out the sleeves, so I should have bought more. The trims are all from etsy. Seven yards of wide embroidered mesh trim (from HARMONYDIYLIFE), twenty yards of metallic embroidered mesh trim (from lacetrimwholesalers), and four yards of braided trim (from ddideas). I spent less than thirty dollars for the lot of them, and really lucked out in terms of color. They match the brocade perfectly. Once my materials were sorted, I did a bit more research and came up with a complete design (since the painting that inspired me only shows the top half of the bodice). I mostly used references from In Fine Style: The Art of Tudor and Stuart Fashion* , which has some great images of paintings and extant garments from the period. 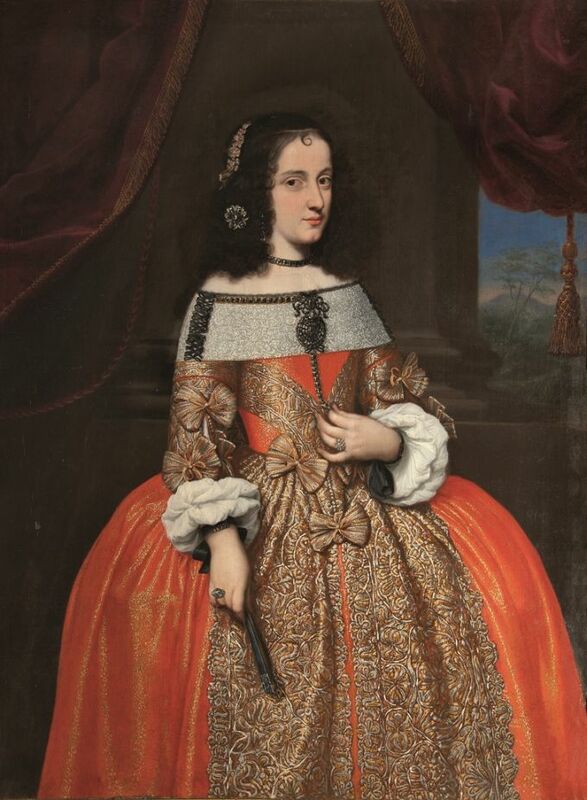 This ensemble was also helpful to me (especially for the skirt), since it’s more complete than a lot of seventeenth century examples. The Dreamstress and Before the Automobile have made dresses from this period, and I found their write ups helpful in terms of understanding the construction. When it came to the pattern I discovered two in my collection – one in Patterns of Fashion*, by Janet Arnold, and another in The Cut of Women’s Clothes* by Norah Waugh . I ended up using the pattern from Norah Waugh’s book, with a few alterations. I used a trick mentioned in one of the blog posts linked above, and fitted my first mock up over 18th century stays. I lowered the neckline, let out the waist, lowered the waistline, and made the front piece longer. I debated about cutting the front and sides as a single piece, but decided assembly would be easier with them separate, so that’s what I did! Then I made the base layer. Which is effectively fully boned stays – there is so much boning in them. The channels were all marked onto cotton, then backed with medium weight twill and sewn by machine. I used plastic quarter inch boning to fill them, then assembled the bodice. I did a fitting here, and realized the bodice was too big! Well, too big might be a stretch. but it wasn’t giving me the shape I wanted, so I removed a half inch of material from the side panels. Then I cut out the top layer from the brocade which was backed with fusible interfacing. I wanted to avoid the bodice being thick, or heavy, but I also wanted the top fabric to be thick enough to hide the boning. I haven’t had any problems with that, so I’m glad I decided to interface it. Lace was sewn into the seams (which were stitched by hand) and in a straight line on the back edge. Lace was also sewn onto the front panels. A lot of lace. Three rows of embroidered mesh ribbon, with the wider embroidered trim near the neckline. I also cut out brocade strips from the “wrong side” of the fabric, sewed those down, and covered the edges with lace. This added more depth to the front of the bodice. I basted the center front seam first, just to make sure everything lined up. Then sewed it by machine. Then the side seams were sewn. I pinned the top layer of fabric to the base layer. The tabs and neckline were cut without seam allowances, so I whip stitched the edges together. But the back edges, and the bottom edge of the front panel were folded over the base layer, then sewn down. Now it was time to bind the tabs. I hate binding tabs. I always do a really terrible job – and that’s when working with lightweight cottons! I figured binding brocade would be impossible. Since I was already prepared for them to look bad, I decided to try a new technique and used half inch wide strips of leather. Both the top, and bottom edge were sewn by hand. I don’t think the end result looks great. But I liked doing it all by hand, and the leather curved around the edges better than I had expected. I also liked being able to snip the underside without worrying about fraying. And a close up. I cut the strips from a skin I bought on ebay a while back. I don’t think it was quite as soft/thin as the kid leather that is usually used for this, but it was easy to get a needle through. And my sewing room smelled like leather for days! Next up was the lining – cut from two pieces of cotton and sewed together at the center front. There weren’t any raw edges on the tabs, so I didn’t bother lining them. The lining was whip stitched to the base layer. Then I sewed all the eyelets! It was a bad week for my fingers between these and the tabs, but the embroidery floss I bought matches the fabric really well and I’m happy with how they look. And the lined interior. The back edge of the lining was sewn after I finished the eyelets so it would cover the loose threads. I also fray checked the back of every eyelet, since brocade is prone to fraying. Now I had something that looked like this! I sewed the shoulder seam, then did a fitting. Which went surprisingly well. The waist is a little tight, but there isn’t any gaping in the back. And it fits my shoulders nicely. I was even happy with the neckline! I finished the bodice off with more binding. I used quarter inch wide gold bias tape for the neckline, and half inch wide bias tape in matching brocade to finish the armscye. Thanks for reading, I hope you enjoyed! I should be back with another one soon. Part two of this post can be read here. 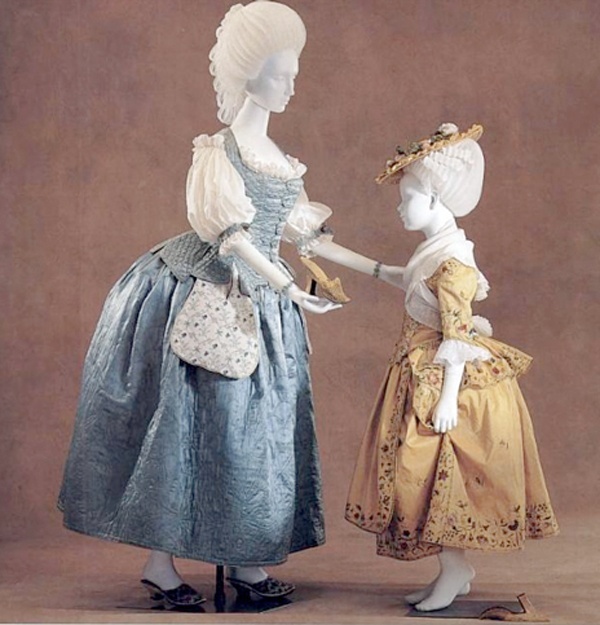 This post is about making the sleeves, skirt, and bonnet for an 1830’s ensemble. I posted about making the bodice for this project a few months ago but didn’t finish the ensemble until last week! I looked at a lot of sleeve examples from the 1830’s but finally decided on something a little silly that would let the plaid really shine – shirring. I sketched a few designs but ended up making the the sleeves with four portions – two shirred upper portions separated by piping, a loose puffed portion, and the cuff. The first step was cutting out four sixty inch wide strips. Then I used the lines in the plaid as a guide for gathering the strips down. This was very time consuming to do. Each sleeve had seven rows of gathering – that’s 420″ of fabric that had to be gathered down, and that’s just for one sleeve! Then I sewed piping onto the bottom edge of each piece. The second shirred panel was sewn on, just below the piping. Then I trimmed the top of the sleeves so they would fit the armscye. The third portion of the sleeves we large rectangles. I turned the bottom few inches of the side edge inward to hide the raw edges, then gathered the top and bottom edges. The top edge was gathered to the width of the shirred panels, and the bottom edge to the width of the cuffs. They were sewn on to the shirred panels. Then the top portion of the sleeves were lined with cotton to hide the raw edges. The cuffs are interfaced rectangles of cotton with the edges ironed inward. Then I sewed piping onto each edge. I used whip stitches for this, so the stitching wouldn’t be visible. The cuffs were sewn onto the sleeves by hand, with more whip stitches. Then lined with cotton. The fabric is lightweight enough that even when gathered down this densely it doesn’t add much bulk to the seam. I did up the side seam, then covered the raw edges with plaid bias tape. The final step was sewing two hooks and bars into each cuff. I sewed the sleeves on by hand, with slip stitches, and then the bodice was complete! I’m pretty happy with this. At first I thought the plaid was too busy, and the shirring looked odd with the pleating, but I got over that and now I think it’s wonderful. I didn’t take very many photos of making the skirt since I made it in two hours the night before we photographed this project. But it’s pretty easy to explain since the skirt is just a large rectangle! I turned the hem inward by a half inch, then inward again by two and a quarter inches. I used a cross/catch stitch for this, and I have a tutorial on the process that can be watched here! The top edge was pleated with knife pleats. I originally had the waistline being straight, but after a fitting I realized it was too long in the front. I cut the waistline on an angle so it was two inches shorter in the front than in the back, which leveled the hem. Then I sewed on the waistband – this was done by machine to save time. The back edges were turned inward twice to form a finished edge. Then I sewed hooks and bars in. The back seam was done up with a french seam. And that was it for the skirt! I hemmed it to sit nicely over a single cotton and tulle petticoat, along with a weird bum pad I made for an 1880’s dress. This caused it to flare out a bit in the back which wasn’t uncommon in the 1830’s. The final piece for this project is a bonnet. I used this as my main reference image and pinned paper onto a wig head until It had the shape I wanted. I transferred that onto a new sheet of paper and cleaned up the edges. Then I cut the pattern out from heavyweight interfacing. I sewed wire into the edges of each piece, then covered them with velvet. The cap portions of the bonnet were lined with scraps of silk taffeta, then sewn together by hand. I lined the brim with bright orange silk shantung, which matches the piping on the dress. It was sewn in with whip stitches, then sewn onto the cap! I’m pretty happy with how the shape turned out, and I love these materials together. Since the dress is so wacky I decided to keep the bonnet somewhat simple. It’s decorated with strips of orange silk that form a criss cross pattern with a bow in the back and ends that fall at either side. These can be used as ties, but the bonnet stays in place thanks to a comb pinned into the back of the brim. I should have photos of the finished ensemble up soon – we took some in a pumpkin patch, which made a nice backdrop for this fun dress. I just have to finish editing them!